Pam Grier in Jackie Brown methinks. Did I say Jackie Brown? Sorry, I meant to say I think this is from Foxy Brown. I’m also guessing its Jackie Brown but can’t recall her wearing something over her head. . .
Wow, u guys are good! 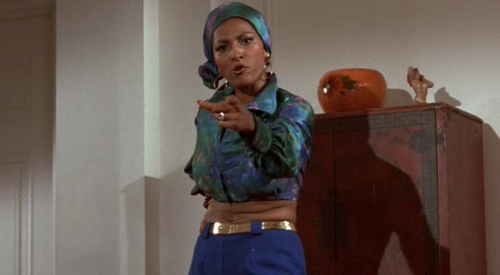 It’s Pam Grier in Foxy Brown (1974). Me thinks that Foxy is the true Blaxpoitation hero – much more than Shaft (who was featured in Wapi? (part 15) last summer).